Neither of these old wives’ tales is suitable as the basis for your heating and control strategies. It is true that in the morning, the temperature that may have drifted hot or cold overnight must be overcome. But that process will use less energy than maintaining that temperature for 6 or 8 or 12 hours during which you get no value from maintaining that temperature. Thermodynamics helps us understand why this is true. In the winter, the warmer your overnight temperature, the more heat will flow out of the building; and in the summer, the same applies for air conditioning. That heat flow is proportional to the difference between the indoor and outdoor temps. See here for an old, but effective, graphic from NASA on this. These thermodynamic realties are the primary reason that the U.S. Department of Energy advises using set backs. See here for that recommendation. 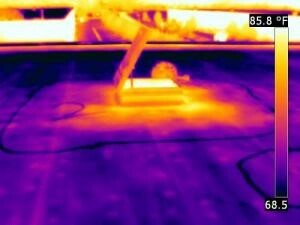 This infrared image shows the heat flow out of a roof hatch. And as for operating equipment more efficiently, modern heating and cooling equipment is designed to cycle thousands of times in its useful life. It is true that excessive cycling, a.k.a. “short cycling” is inefficient and detrimental, but that situation has nothing to do with letting the unit sit idle all night and then running it in the morning to bring temperatures to comfortable levels. True short cycling is distinguished by average on/off cycle times of less than ~4 minutes, over and over. Many modern roof top units have built in systems to bar the unit from behaving in this way. So while some old wives’ tales are based in some kernel of truth, this isn’t one of them. You’ll save much more by using off-hours setbacks than you’ll spend cranking up the heat or air conditioning for a few minutes to bring the temperature to a comfortable level in the morning.